I love Texas! – all of Texas, but I must confess that the Texas Hill Country is my favorite area of Texas. I grew up in Central Texas right on the edge of the Hill Country. My father had this dream of having a ranch, so we took many road trips into the Hill Country on spring and summer weekends checking out property for sale. My father never got his ranch, but I got a chance to experience the Hill Country up close and immersed in its beauty. We fished, and hiked in many of the Hill Country’s parks and natural areas. Inks Lake State Park was our favorite location, since it was the closest to where we lived. So many really great memories not only for me, but also for my family. There are a number of definitions for what constitutes the Texas Hill Country. Generally speaking, the Hill Country includes those counties within the boundary of the Balcones (escarpment) Fault on the south and east and what is geologically termed the Edwards Plateau. Some of the better bluebonnet and other wildflower displays are found where there is good drainage and in sandy loam type soils. This includes areas in Burnet, Gillespie, Llano, Mason, and San Saba counties. Once you get into the rocky yellowish caliche clay soils the bluebonnet displays are not as extensive, you still might find some roadside blue and fields of other colors. 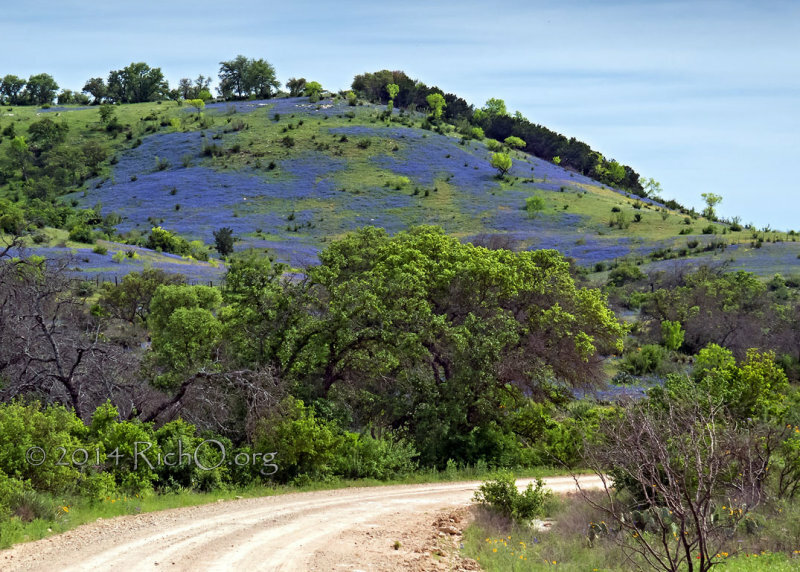 Aside from the scenic wildflower displays that usually cover the Hill Country from March through June, the roads through the Hill Country are very scenic. This is especially true of areas south of I-10 and west of I-35. Travel along RR-337 from Medina through Vanderpool and Leaky to Camp Wood, and you will begin to understand how uniquely beautiful Texas is. Although not known for its extensive wildflower displays, in good years its roadsides are lined with a complete artist’s palette of colors from red, blue, white, purple and yellow wildflowers. Spend a weekend or two traveling the main roads and side roads of the Hill Country and you will know why it has a special place in my heart. Visit the many towns with some of the most unique shops and restaurants. Two of my favorite Texas Natural Areas are in the Hill Country: Enchanted Rock Natural Area and Lost Maples Natural Area. Much of the Texas Hill Country consists of working livestock ranches and farms. Please be respectful of the property and the livestock which often roams free along some of the roads. There are some really scenic views down county roads, but these roads are often very rough and will tear up the typical street car. And along these roads are where most of the working ranches are located. DO NOT enter the property beyond the right of way of the road. Regardless of whether there is a fence or not, you are trespassing if you enter a property without permission of the owners – and there are lots of gun owners in Texas. All of the owners, I have met over the years are very friendly, but they are very concerned about the extra traffic along their roads where livestock is roaming free. Watch out for the snakes and fire ants along these out of the way county roads! Be mindful of the weather! Flash floods can happen without much warning in Texas and the county roads I have traveled, cross streams without and man-made crossing or have low water crossings. Texas law prohibits crossing a road that is barracked due to high water – we do not want to pay for your high-water rescue or burial! I have a complete eBook covering all the popular Texas Bluebonnet and other Wildflower Routes in the Texas Hill Country at: http://www.wildflowerhaven.com/eBooks . The eBooks are free to preview - donate if you use them for your wildflower season travel plans.